1. The best known of all doggy statues is probably Greyfriars Bobby. The story of the faithful Skye Terrier, who kept watch over his master’s grave for 14 years, so touched the heart of Baroness Angela Georgina Burdett-Coutts that she erected a memorial granite fountain with a statue on top. 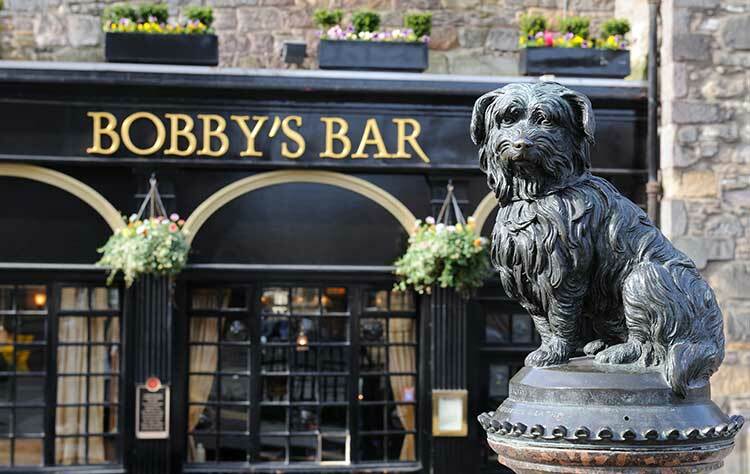 Unveiled in 1873, Edinburgh’s smallest listed building has become a tourist attraction and, over the years, so many have rubbed Bobby’s nose for luck that he needed a nose job to repair the damage! Twelve months later the restoration was wearing off, leading to an appeal to leave his nose alone. 2. Another famous Skye Terrier can be spotted at Colinton Parish Church near Edinburgh. Author and poet Robert Louis Stevenson loved dogs, and Cuillin was his constant childhood companion. Sculptor Alan Herriot captured the magic of many happy hours spent together, portraying RLS sitting on a tree stump scribbling in a notebook — but it is Cuillin who really has his attention. 3. Once a famous actor and producer, Esmé Percy appeared in 50 fi lms, including an early Hitchcock, and even had a role especially written for him by George Bernard Shaw. Nowadays he is virtually forgotten by all but a little bronze terrier, caught in an eternal playbow in Kensington Gardens, London. Percy’s youthful good looks were marred after breaking his nose in an accident and losing an eye following a ‘playful mishap’ with a Great Dane. During a performance in 1949, his glass eye popped out and rolled across the stage, much to the consternation of the rest of the cast. Notwithstanding, Percy continued to adore dogs and, after his death in 1957, his friends commissioned this statue in his honour, sculpted by Silvia Gilley. 4. The 18th century painter, engraver, and satirist William Hogarth, nicknamed the ‘Painter Pug’, was famous for his love of the breed. Pugs were often included in his works, with his favourite, Trump, featuring in the 1745 self-portrait ‘The Painter and His Pug’. In 1741, Trump was sculpted in terracotta by Louis-François Roubiliac, and he was also reproduced in Chelsea porcelain and as black basalt ware by Wedgwood. But when a statue of Hogarth sculpted by Jim Mathieson was commissioned in 2001, the little dog very nearly (and unimaginably) wasn’t included. At the last minute, an extra £10,000 was raised to enable him to be modelled and cast in time to join the master who adored him, on the plinth near their London house. 5. There are many examples of dogson medieval tombs, but only one who has a name. Half hidden among her skirts, Terri (or possibly Cerri) lies at the feet of Dame Alice Cassey at the 14th century family tomb in the Saxon church of St Mary’s at Deerhurst in Gloucestershire. It is the only known example of a named animal on funerary brass, and probably the oldest pet memorial in England. 6. Outrage and an upsurge of popular support for the British anti-vivisectionist movement followed allegations of inhumane and illegal experimentation on a brown terrier at University College London. A Brown Dog statue, sculpted by Joseph Whitehead, was erected in Battersea, featuring a bronze statue of the terrier, and carrying a plaque naming and shaming UCL. It had to be assigned round-the-clock police protection from incensed medical students, sparking off a series of Brown Dog riots, and leading to questions being asked in Parliament about the expense of such protection. Despite injunctions and petitions to save it, in 1910 the statue was ripped down under cover of night and destroyed. In 1985, the terrier returned when a new statue by Nicola Hicks, modelled on her own terrier, Brock, was erected. 7. If you find yourself near Belgrave Square in London, pause for a moment to admire the two handsome dogs lounging at the feet of Sir Robert Grosvenor, a nod to the Talbot Hounds which take a prominent place on the family coat of arms. Along with Greyhounds, they are the only breed of hound used in English heraldry. More Talbot Hounds can be found in Trevelyan Square, Leeds, where four of them, holding fountain spigots in their mouths, support a large stone bowl. 8. While taking a stroll in the grounds of Antrim Castle in 1607, the new bride of Sir Hugh Clotworthy was attacked by a wolf. A mysterious Wolfhound came to Lady Marian’s rescue and killed the wolf, but vanished again after she had tended his wounds. One dark and stormy evening some years later, the Wolfhound reappeared; standing on the battlements, his howling raised the alarm that the castle was under attack. With the enemy defeated, as dawn lit the sky, the Wolfhound was transformed into stone, although some say that the hound died helping defend the castle, and Sir Hugh had a statue made in his honour. Superstition says that should the statue ever be moved from the castle grounds, disaster will follow, so although the castle no longer stands, the Wolfhound continues to keep his watch in the castle gardens. 9. Over 60 statues dedicated to Scottish poet Robert Burns exist worldwide, 15 of them in Scotland, but, scandalously, not all of them feature his favourite dog Luath, from whom he was said to be inseparable. When the collie tripped up Jean Armour, Burns’ future wife, at a wedding, it gave the poet the courage to speak to the woman who was to become the other love of his life. Happily, the ‘gash and faithfu’ tyke’ can be admired sitting at the feet of the poet in Dumfries town centre. 10. Edinburgh and its environs do seem particularly blessed with sculptures of famous canines: keeping novelist Sir Walter Scott company on the world’s second largest monument to a writer is his beloved Deerhound, Maida. Also featuring on the monument is a Dandie Dinmont Terrier — the breed named after a fictional character in one of Scott’s novels.